There was a time when I was not aware that April is Parkinson’s Awareness Month. That changed when my husband, John, was diagnosed with Parkinson’s disease (PD) five years ago on March 31st—what he wishes had been an early “April Fools” joke but wasn’t. While we did not choose the PD journey, we have learned much about ourselves and from others in the process. Researchers estimate that one million people in the US and five million worldwide live with Parkinson’s disease. The cause is unknown, and although there is presently no cure, for many, there are medical and surgical treatment options to manage its symptoms. The interesting and challenging reality about Parkinson’s is while there may be a constellation of symptoms, the disease “shows up” differently in each person—early in John’s diagnosis, we heard it referred to as a “snowflake” disease because no two people experience PD in the same way. When John and I first learned he had Parkinson’s, we went through the stages of grief first outlined by Elisabeth Kübler-Ross—denial, anger, bargaining, depression, and acceptance. I say “we” because family members of those diagnosed with a disease are impacted as well. We both spent some time in the shock/denial phase. Although we knew something was “going on” with John, we never expected it to be Parkinson’s. I remember being very angry—not at John, but at the universe. This was something we did not want in our lives—who would? Ultimately, we moved through the stages of grief and loss to acceptance. There may be a misconception that when people move through the five stages of grief they “arrive” and “stay” at acceptance. This is not the case. Most of the time, John and I are at the “acceptance” phase. But there are times when we revisit the other stages. John has periods when it is easier to be in “denial” that he has PD. Because his tremor is often controlled by medication, when it is not obvious that he has PD, he may choose not to share it with others. We realize this is a “luxury”—there may, and probably will, come a time when he does not have this choice. Other times, John may become frustrated when he can’t do things that he once did with ease—such as button his shirt or sign his name. Having an “incurable,” “progressive,” disease means that each time a symptom becomes more “advanced” (in this case “advanced” is not a good thing), there is a new “coming to terms” with one’s situation—for the person with PD and for his or her partner. Therefore, it is possible to go through the stages of loss many times. And so it is for us all in life. As Judith Viorst (1986) points out in her book, Necessary Losses, “to look at loss is to see how inextricably our losses are linked to growth … to become aware of the ways in which our responses to loss have shaped our lives can be the beginning of wisdom and hopeful change” (p. 5). How have we chosen to respond to PD and what would we recommend to others? The first step for individuals diagnosed with PD is to choose a doctor who is right for them—preferably a neurologist who specializes in Parkinson’s and movement disorders rather than a general practitioner. Having medical care you trust is important to determine the medicine, exercise, and diet best for you. Because John is a veteran, he has access to the Veteran’s Medical Center in Philadelphia, which is one of six PADRECC (Parkinson’s Disease Research Education and Clinical Center) facilities in the United States. He has received excellent care from this team of doctors and professionals. A second step we have found helpful is getting to know others with PD who can empathize and share information. We attend a support group for people with PD and their care partners and have met some wonderful people. There are many different support groups—ones for people with PD who experience the same stage of the disease, mixed groups for people with PD and their partners, groups for women with PD, support groups for care partners, dance groups, exercise groups, and others. A third step we have found helpful is to get involved. Trisha Torrey (2011), in an online article “Coping With Grief—From Difficult Diagnoses to Medical Errors and Mistakes,” suggests there may be a sixth stage of grief, “proactive survivorship,” which occurs when people begin to take their experiences and create something positive for others from them. Certainly, Michael J. Fox is a stellar example of this. John and I try to be “proactive” and “empowered” in the approach we take to Parkinson’s. Six months after John was diagnosed, we designed and facilitated a workshop, PD—Transformational Journey, which we presented to approximately 90 participants. We also participated in a panel discussion for those with PD and their care partners. John has been asked to be the first Patient Advocate for the Philadelphia PADRECC center, which will offer him chances to get involved and support others. Recently, we completed three days of training presented by the Parkinson’s Disease Foundation (PDF) to become part of the Parkinson’s Advocates in Research (PAIR) initiative. The goal of this excellent program is to form partnerships between researchers and those with Parkinson’s disease to bring about better treatments at a faster pace and to find a cure for PD. Through the PAIR program, we learned ways we can be involved during all phases of the research process and how we can help to educate others about Parkinson’s disease. Not only did we learn about the research process, we met wonderful people who share similar challenges and want to become involved as well. It was an empowering experience. The program reinforced the importance of participating in clinical trials—80 percent of clinical studies are delayed at least one month because of the lack of research participation. Finally, we have met many people who find creative outlets that help them deal with Parkinson’s by engaging them in satisfying activities that provide meaning, and joy. At the PAIR program, we met Patricia Davies who created a three-minute video presenting her pets’ view of PD (a Yorkshire terrier named Patrick and a cat named Sophie) shown at the World Parkinson Conference. Patrick’s Story is a touching video not to be missed! We have become friends with Michael Young and his wife, Bel. Mike has always been creative. He plays the guitar beautifully and composes songs. Recently, Mike and Bel have become involved in a joint venture of creating stunningly beautiful photographs. Mike writes a blog about his journey with Parkinson’s and is an excellent example of proactive survivorship and helping others. 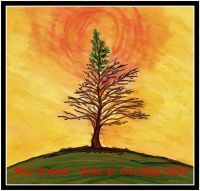 My husband John, who has always been a creative photographer, started to paint and write poetry after he was diagnosed with PD and is learning to play the guitar. In my research of older creative adults, I found creativity helped give meaning to their lives, distracted them from physical ailments, and was a strong motivator to keep going. I believe creativity helps those with mental and physical challenges in the same way. April is Parkinson’s Awareness Month. While those with PD and their partners certainly need no reminder that Parkinson’s exists, it is helpful to be reminded that there are proactive steps one can take to live a full and active life despite the disease and ways to contribute to better treatments and finding a cure. John likes to say “while he has PD, Parkinson’s does not have him.” Parkinson’s does not define him. I hope anyone who wrestles with a significant mental or physical challenge will adopt this attitude. April is an appropriate month to increase awareness for us all—it signifies the coming of spring, hope, and possibility. Kubler-Ross, E. (1969). On death and dying. New York, NY: Scribner. Viorst, J. (1986). Necessary losses: The loves, illusions, dependencies and impossible expectations that all of us have to give up in order to grow. New York, NY: Ballantine.